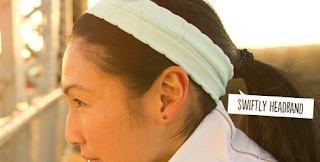 For those of you that have noticed this header picture on the lululemon website under headbands, the Swiftly Headband is now featured in the February Issue of Runners World Magazine and it looks like it’s coming in a minty green and a pale blue. Maybe Aruba and Clear Sky? I don’t think the blue is Angel Blue since Angel is almost a Tiffany blue with some green undertones. 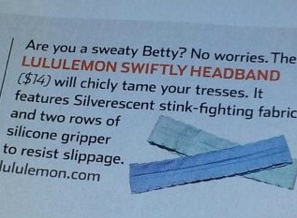 It’s also neat that this is made out of anti-stink silverscent and has double rows of grippies. It’s hard to tell from this picture though. Any of you Lulu insiders care to share anonymously what blue that is? "Lots of Photos Of The It’s Happening Jacket and One Pigment Blue Chai Time Pullover Picture"
"More Photos Of Pigment Blue Chai Time Pullover II"